Randy Finch's Film Blog: Are Defenders of Old World Revenue Models Really In Favor of a Price-Fixing Scheme That Landed Apple and the Major Book Publishers in Federal Court? Are Defenders of Old World Revenue Models Really In Favor of a Price-Fixing Scheme That Landed Apple and the Major Book Publishers in Federal Court? Amazon's control over ebooks has pissed-off a lot of people. And it looks like Prof. Jon Taplin is one of them. And that's a problem for book publishers. Right now the long-standing fear that Amazon might use their dominant position in book selling (ebooks and old school books) to push around even the biggest book publishers is in the news: Just this week the tense relationship between Amazon and Hachette bubbled into view, with claims that Amazon had pulled book-buying pages for some of Hachette's most-anticipated upcoming releases (e.g., The Silkworm, the new novel by J.K. Rowling, writing under the pseudonym Robert Galbraith). This latest skirmish (apparently over terms for e-book prices) dates back to at least 2009 and the efforts by Hachette and the other big book publishers to find another way (besides Amazon) to sell their ebooks. That's why, back in 2009, reps from Apple met with reps from the major book publishers and agreed to compete with Amazon – and to elevate the price of ebooks. But, and this is significant to filmmakers - and anyone else who wants to sell their content online - there are laws against price-fixing. That's why the 2009 book publisher meetings were held in secret. And why there were lawsuits against Apple and the big publishers when evidence of their collusion started to leak. But the federal courts went the other way. From his tweet, are we to infer that Prof. Taplin wants book publishers to have the right to collude to set prices? Or that the justice department misapplied the existing law when they went after the book publishers and Apple when it became apparent that they had colluded to raise the price of ebooks? Are we to think that Prof. Taplin wants the old system of gatekeepers selling media at higher prices to survive, even if the actions of the Old World gatekeepers stretch (break?) the law? What about the government’s victory at the trial level (note: Apple is appealing)? Doesn't the history of this case suggest that, at the very least, the method that Apple and the publishers pursued in their battle with Amazon was deeply problematic? 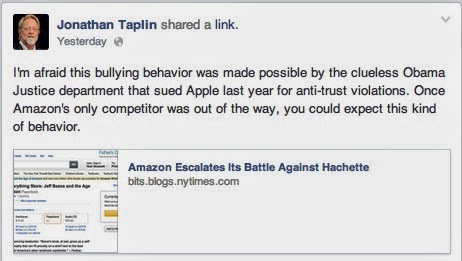 Instead of acknowledging the legal defeats the book publishers and Apple have suffered in defending their collusive acts, Prof. Taplin tweets that the Obama Justice Department was “clueless” in pursuing their antitrust case against the major book book publishers and Apple back in 2012. If the Obama Justice Department was "clueless," what about the 16 states that filed their own suits against Apple, Macmillan, Penguin and Simon & Schuster in 2012? The antitrust law is very complicated, and it may need to change to fit new realities, but shouldn’t learned critics take the time to understand the law, the facts and how the case was decided? Does Prof. Taplin understand that, once evidence of collusion between the book publishers and Apple started to leak, many cases were pursued by many parties - of all political persuasions? The 2013 decision against Apple in Federal Court was rendered by Judge Denise Cote, who is not an Obama lackey. In fact, Judge Cote was appointed to the federal bench in 1994, when Barack Obama was still at the beginning of his career as a lecturer at the University of Chicago. 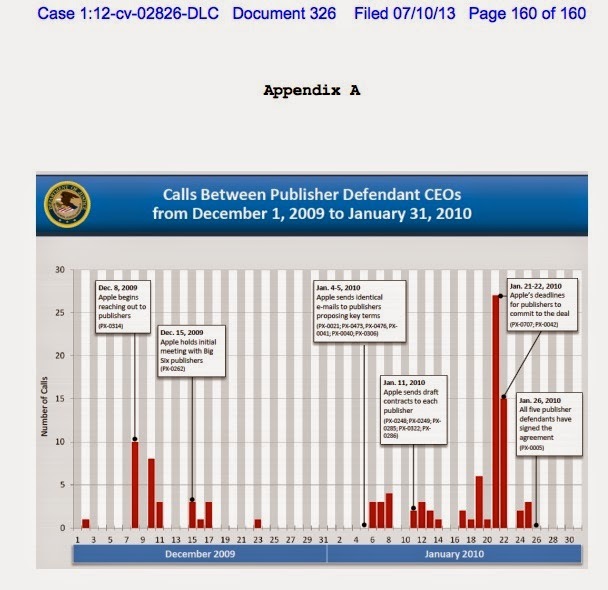 Was Judge Cote "clueless" when she wrote (in her 160 page opinion): "The plaintiffs have shown that the publisher defendants conspired with each other to eliminate retail price competition in order to raise e-book prices, and that Apple played a central role in facilitating and executing that conspiracy… Without Apple's orchestration of this conspiracy, it would not have succeeded as it did in the Spring of 2010." I understand that Prof. Taplin isn't happy with Amazon's control of the e-book market. And yes, Amazon’s level of control has forced down ebook prices and they're currently bullying Hachette (as many predicted they would). I get why the Old World publishing houses don’t like Amazon’s dominance. But does Amazon’s market control and bargain-pricing excuse price-fixing between Apple and the major book publishers? If Amazon is a problem, why break the law? Why not take Amazon to court to challenge their dominance of the market? Doesn’t the antitrust law have anything to say about that? Isn’t Amazon’s control in ebooks prima facie evidence of an illegal monopoly that restricts trade? In Congressional debate (April 8th, 1890), Senator George Hoar, an author of the Sherman Antitrust Act, provided Amazon with a pretty good defense of their position, should they be accused of an antitrust violation: "[A person] who merely by superior skill and intelligence...got the whole business because nobody could do it as well as he could was not a monopolist… [but was if] it involved something like the use of means which made it impossible for other persons to engage in fair competition." Of course, that's a version of the same argument Apple will be using on appeal - they were just engaged in fair competition.